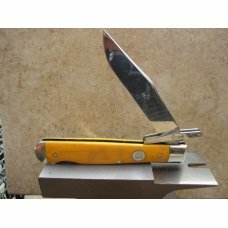 You will find traditional folding and fixed blade knife patterns for sale here that were made by this company that sport a a handfull of different knife brands including Queen, Queen Classic, Schatt and Morgan, Robeson & more. Some of the companies more popular lines of knives include the File & Wire series & the Keystone series. AAPK members post those & most others for sale here periodically. Queen banded knives will appear in this category. We have separate categories for Schatt & Morgan & Queen Classics. Visit them all! Queen #28 Stag Series 6120 Large Jack Knife "Q83" USA Tang Stamp Etched c.1983 - Etched "Stag Series 6120 Made in USA" - Very Pretty Genuine Stag Hand..
Queen USA #38 Genuine Stag M.S.K.C.A. Coke Bottle Folding Hunter Knife Q79 Tang Stamp Etched c.1979 - 1 of 100 - Serial # 084 - Beautiful Genuine Stag..
Queen #75 Made in USA Imitation Winterbottom Bone Hunting Fixed Blade Sheath Knife c.1980's - Imitation Winterbottom Bone Handles - No Cracks - Nice U..
Queen Red Bone Folding Hunter New in box Never carried or shaepened D2 Steel Red Bone Handles with no chips or cracks No Wobble ,No Half Stop . & Grea..
Queen Steel - Big Chief #45M: 3 3/8” closed, in original box, cast aluminum frame and stainless steel blade. All mint…Great knife for salt water env..
Queen Steel - Big Chief #45S: 5” cast aluminum frame and serrated stainless steel blade with half stops. Etched “DIVERS SUPPLY”. Never used…Great ..
Queen Steel - Big Chief #45M: 3 3/8” closed, cast aluminum frame and stainless steel blade with half stops. All mint…Great knife for salt water envi..
MAKER: QUEEN PATTERN: #15; Half Congress LENGTH (Closed): Approx 3 ½ inches BOLSTERS: Nickel Silver SHIELD: None HANDLES: Winterbottom De..
Queen #2 Jack Knife with Great Mother of Pearl Handles! Queen Pearl #2 Blade Etch -NOS. A small blemish on the back side of the main blade, very light..
Queen Cut Co Titusville Pa Stamp at tang Metal Scrolled Handles Factory Fresh Never Carried or Sharpened No Box , No wobble, No Half Stop ,& Nice Sna..
Vintage 1979 Queen Master Cutler Collection GunStock I Pocket Knife with Beautiful Handles. Comes in Hard Cardboard Display. Handles have no chips or ..
2005 Queen ,Schatt & Morgan Cutlery Show Brown Bone Tiny Texas Toothpick New in Box never carried or sharpened Brown Bown Handles with no chips or cra..
Queen Steel Made in USA Q82 Pearl "Wolverine Knife Collectors Club" Gunstock Jack Knife c.1982 - 1 of 150 - Serial # 089 - Beautiful Genuine Mother of..
Queen Steel Made in USA Q76 Pearl #57 Medium Stockman Knife c.1976 - Beautiful Genuine Mother of Pearl Handles - No Cracks - Nickel Silver Bolsters - ..
Queen Cutlery Co. Titusville PA Pearl #14 Peanut Knife - Beautiful Genuine Mother of Pearl Handles - No Cracks - Nickel Silver Bolsters - Brass Liners..
1 of 1 factory sample main blade says queen box says limited production Schatt & Morgan #60 Sway Belly Whiskey mint with COA never seen this co..
1977 Queen Brown Bone Mini Trapper Etched on Master Blade ( Master Cutler Collection Stainless ) Spey Blade has an Etch of a Man holding a Knife Facto..
1994 Queen Rawhide Series No # 9200 No Box 440 Stainless Steel Nice Wood Handles with no issues Nickel silver Bolsters & queen Shield , Brass Pins & ..
Queen Cutlery USA No. 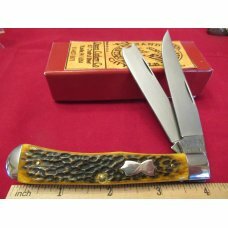 8075 The Rawhide Series Wood Barlow Knife c.1980 - 440 Stainless Steel Blades - Wood Handles - No Cracks - Nickel Silver Bolster..
QUEEN CUTLERY COLLECTORS CLUB, CHARTER MEMBER 33 (OF 60), INITIAL CHARTER/COLLECTORS' CLUB KNIFE, WITH PRESENTATION BOX AND COFFEE MUG. PATTERN #51, D..
Queen City 2012 Aged Honey Amber Stag Bone #31 Large 2 Blade Congress Knife in Box - Beautiful Genuine Aged Honey Amber Stag Bone Handles - No Cracks ..
Queen City 2012 Aged Honey Amber Stag Bone #376 Swell Center 2 Blade Jack Knife in Box - Beautiful Genuine Aged Honey Amber Stag Bone Handles - No Cra..
Queen Dan Burke QN9868 Saw Cut Bone Large Daddy Barlow Knife in Box - D2 Tool Steel - Beautiful Genuine Saw Cut Bone Handles - No Cracks - Nickel Silv..
Queen City 2012 Aged Honey Amber Stag Bone #83 Coke Bottle Folding Hunter Knife in Box - Beautiful Genuine Aged Honey Amber Stag Bone Handles - No Cra..
Queen Steel USA 44B Delrin Folding Hunter Push-Lock Knife NIB - Jigged Delrin Handles - No Cracks - Nickel Silver Bolsters - Brass Liners - Locks Up T..
Queen Red Stag Gunstock Pattern . New in Queen Box never carried or sharpened. D2 Steel . Nickel Silver Bolsters . Nice Red Stag Handles with no chip..
Queen Slick Black LTD ED USA Bicentennial Daddy Barlow Knife on Wooden Display 1976 - Serial Numbers of all three: 004894, 004663, 001885 - Slick Blac..
Queen Steel #9A Yellow Stockman Knife in Box - Bone Handles - Cracks at both center rivets - Nickel Silver Bolsters - Brass Liners - Snaps Open and Sh..
Queen Cutlery Co. Titusville PA #20 Bone Toothpick Knife in Box - Bone Handles - No Cracks - Nickel Silver Bolsters - Brass Liners - Snaps Open and Sh..
Vintage 1976 Queen #27 Barlow Pocket Knife w Derlin Handles -Queen Steele #27 Made in USA Blade Etch. 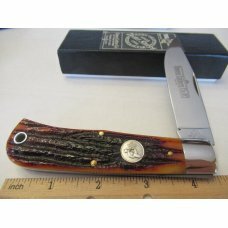 Comes with a counter top or home display cardb..
Queen Steel Hawk Bill Pruner # 1W: Queen Cutlery hawk bill pruner, 4 1/8” closed, 1976, wood handles, stainless steel blade, NS bolsters and brass l..
Queen - Dan Burke Large Daddy Barlow PocketKnife whit Beautiful Multi Color Brown (sawcut?) Bone Handles and a Queen DB tang stamp -NOS & Mint. Grea..
Queen Steel #10 Imitation Winterbottom Bone Burnt Orange Jack Knife c.1950's - Imitation Winterbottom Bone Handles - No Cracks (Miss-Drilled Front Le..
Queen #32 Imitation Winterbottom Bone Congress Knife No Tang Stamp Etched - 1960's - Nickel Silver Bolsters - Brass Liner - Snaps Open and Shut - No W..
Queen Cutlery 2 Blade Doctors / Physicians Pocket Knife with Great Stag Handles & Box -SMKW Viewers Club, 1 of 150 Blade Etch -NOS. 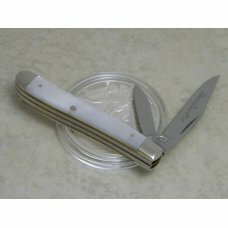 Nice open & close ..
2009 One of 100 Titusville Cutlery Co. By Queen Stag Handle Pattern # TC09129TS . New in Box never carried or sharpened . Nice Stag Handles that ar..
Queen BIG Q Rogers Bone Toothpick is 5" closed. Beautiful tan Rogers jigged bone handles with no issues. Good blade snap. Uncleaned mint condition on ..
Queen DFC USA Barlow Pocket Knife with Derlin Handles, Carbon Blade. Q DFC Over USA & Carbon Tang Stamp. Handles have no chips or cracks and the blade..
Queen USA Bone Lockback 1983 Tar Heel Cutlery Club 2nd Youth Knife - 1 of 100 - Beautiful Genuine Jigged Bone Handles - No Cracks - Nickel Silver Bols..
Queen Cutlery Abalone Doctors Knife Pattern # 96 Custom By Brian Yellowhorse . New in box never carried or sharpened . Pretty Abalone Handles with no..
Sargent USA (Queen City) Jigged Brown Bone Trapper 1992 NKCA Club Knife - 1 of 3500 - Serial # 1440 - Beautiful Genuine Jigged Brown Bone Handles - No..
Stag Jumbo Cigar 1981 NKCA Club Knife by Queen Cutlery - Not Marked Queen but that is who made it - Etched "1981 NKCA 1 of 12000" - Serial # 00949 - ..
Queen Dan Burke # 65 Baby Sunfish in Harvest Orange Bone Handles with the Queen Stamps on both sides of Handles . Rare Knife . 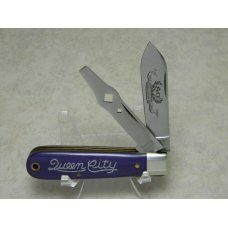 New in Box Never carr..
Queen Cutlery Classic Stag Handle Improved Muskrat . Never carried or sharpened . no wobble . Nice Classic Stag Handle with no chips or cracks . D-2..
1984 Queen City Stag Handle Lock Back . New in Black Drake Well Display . Never toted or sharpened . Nice Stag handles that are chip & crack free . Se..
Queen Big Chief MAKER: Queen Cutlery PATTERN: Big Chief LENGTH (Closed): 5” HANDLES: Cast metal handles with a pattern. Handle ..
Queen Steel #65 Imitation Winterbottom Bone Burnt Orange Jack Knife c.1950's - Imitation Winterbottom Bone Handles - No Cracks - Aluminum Bolsters an..
Rare Queen City Titusville, PA Stanhope Lens "80th Anniversary Queen Cutlery Co. 1922-2002" Jack Knife - 1 of 500 - Beautiful Purple Celluloid Handle..